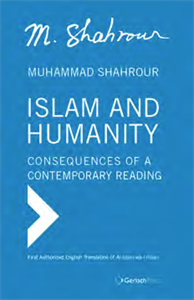 "Explain the Qur'an by the Qur’an"
This new book by Mohammed Shahrour is about the implications of a contemporary reading of the Qur'an. "We must re-examine the prior reading of religion and introduce Islam from its original source, the authoritative revelation, on the basis of a contemporary reading that takes into account the level of knowledge of the 21st century and the scientific and ethical development that have been achieved." Shahrour employs the rules of what he calls tartīl and non-synonymity. As themes of the Qur’an are scattered across Suras, tartīl means to take verses related to one topic and arrange them in a proper order and sequence. This method allows Shahrour to remove apparent contradictions among the texts and to bring them into harmony with one another.